I am probably one of the biggest fans and advocates of the micellar water. I used to swear by some ASDA own brand face wipes until the micellar water came into my life and everything changed from then on. Gone was the constant scrubbing of my sensitive eyes and face to get most of the makeup off and through the entrance of the micellar water it became so much easier and a whole lot better for my eyes and skin. Though I don't always have super sensitive skin, it can get that way so I always like to use products for sensitive skin where I can and a micellar water is great for those times as it literally feels as though you are using water to take your makeup off, some sort of magical water at that. 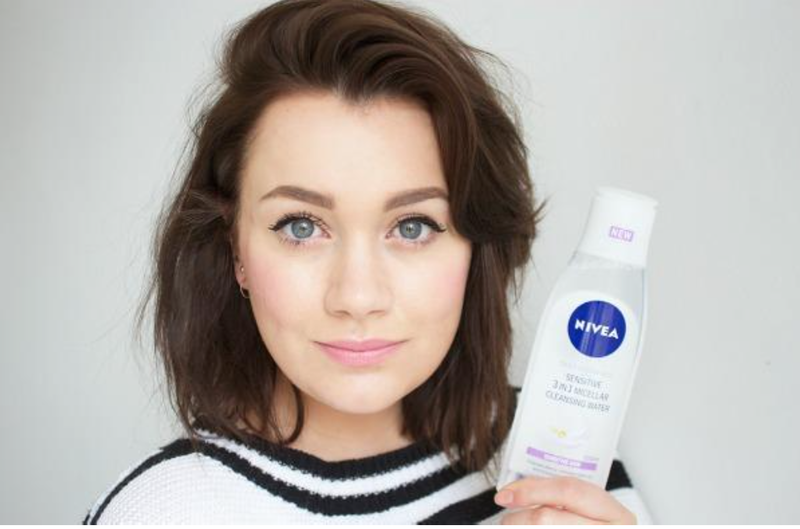 The Nivea 3 in 1 Micellar Cleansing Water is just that also but is specifically targeted for sensitive skin, something I've not actually tried before so I can only imagine how gentle it is against the skin. Just like the other micellar cleansing water's I've tried, it removes the makeup quickly and for lazy girls like me this is just perfect. I find I ALWAYS take my makeup off using micellar water, no matter how tired I am or how much I've had to drink (oops!). The Nivea Micellar Water is free of all perfume, parabens and colourants that would usually irritate the skin so that they make sure that it doesn't but they have used special technology to make sure that it still does its job and cleanses the skin. 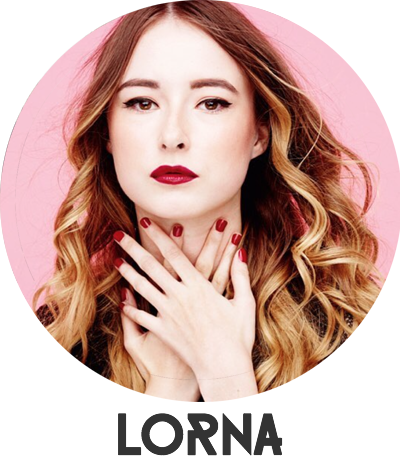 To test this they gave the product to some of my favourite YouTubers including Kate from Gh0stparties and Alix from I Covet Thee (pictured above), alongside Lily Melrose, Patricia Bright and more, to see if the product actually does what it says it does as we know we can trust these beauties! 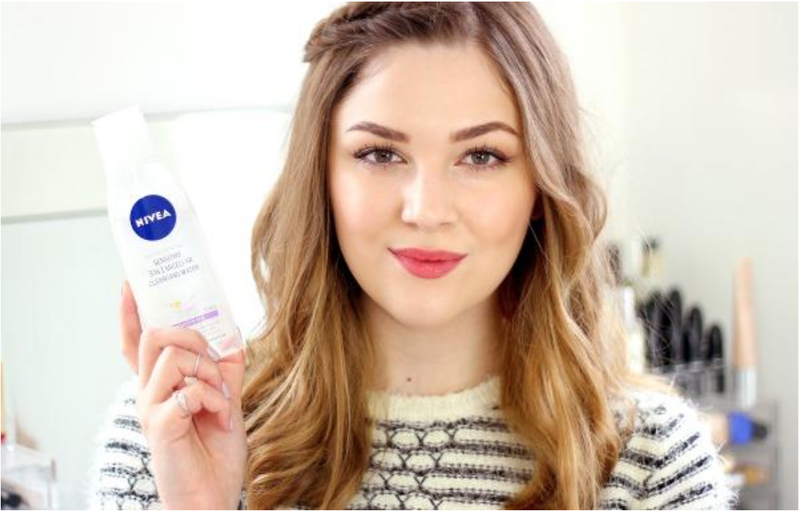 The evidence is in the video above and I feel like it just proves to us what a trustworthy brand Nivea is, I mean I know I want to get my hands on the Cleansing Water now. Excuse me while I pop out to Boots to pick one up! What Micellar Water do you use? *Post sponsored by Nivea but as usual all thoughts are my own! I tried micellar water once but I wasn't sure if I was meant to use it alone or wash my face afterwards. I need to pay more attention to instructions haha. How did you use it? I really like Bioderma, but will try this when I've ran out!